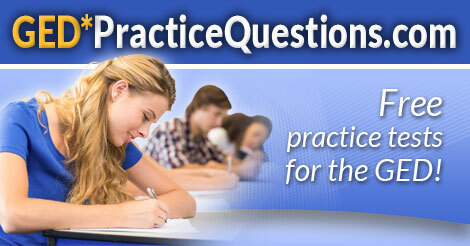 We have hundreds of free GED Practice Questions. This is the best collection of GED practice tests that are available online. These are all high quality, interactive tests, designed to be very similar to the actual questions on the 2019 GED. All of our tests are organized by subject, and we also have test prep tips for each subject. GED Practice Test — This is another website with a full length practice test. Our GED practice questions are now updated for the 2019 GED. After going many years with no updates at all, the test went through a massive revision in 2014. Some smaller changes were made in 2017 and 2018. The revised GED test is definitely more challenging and will require more review and practice. The GED gives students who didn’t finish high school the chance to earn their high school equivalency credential. Along with certifying high school level academic skills, the new test is specifically designed to measure career-readiness skills as well as college-readiness skills. There are four content areas: Mathematical Reasoning, Reasoning Through Language Arts, Science, and Social Studies. It is a computer-based test that takes over 7 hours to complete. There are many question types including multiple choice, drag-and-drop, fill-in-the-blank, drop-down, hot spot, and short answer. Instead of a stand-alone essay question, the latest version of the test features an extended response essay question as part of Reasoning Through Language Arts. If you want to pass this challenging test on your first try, make sure you work through plenty of GED practice questions. Getting a good study guide is also very helpful, but the most important thing is to spend a lot of time reviewing the 4 major subjects. Get started on your test prep now with our free GED practice tests!